• Kills over 40 soft bodied and hard bodied insects on contact, including beetles, aphids, whiteflies, and chinch bugs. • For use on lawns, ornamentals, trees, shrubs and flowers. 2. Connect sprayer to hose. 1. Extend the hose to the farthest point in the lawn or garden away from the water faucet. This will minimize walking on the treated area. 3. Bend small plastic tab back and turn knob clockwise to ON position. 1. To stop spraying, bend small white plastic tab back and turn knob counter-clockwise to OFF position. 3. Relieve water pressure by bending the plastic tab back and turning knob to ON position until water slows to a drip. Then, turn knob back to OFF position. 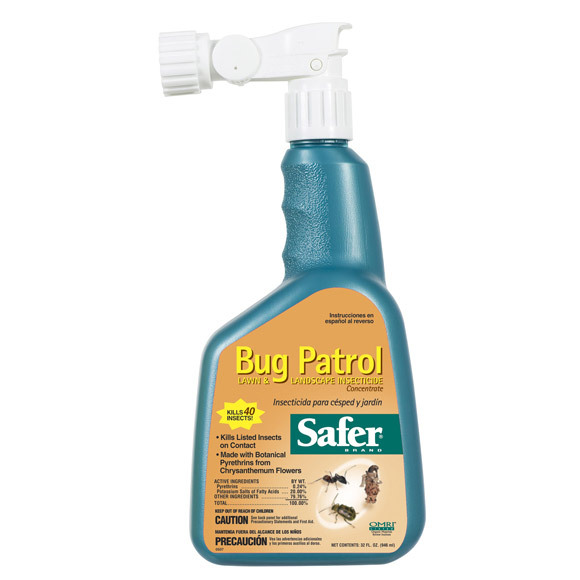 Use as directed above on lawns and turf grass to control (kill) chinch bugs, lawn moth, sod webworm, army webworms, and other miscellaneous pests. Use as directed above on ornamentals including azaleas, camellias, cacti, dogwood, rhododendrons, evergreens, and broad-leafed shade trees to control (kill) aphids, beetles, caterpillars (including gypsy moth larvae, tent caterpillars, webworms, bagworms and leaftiers), lace bugs, box elder bugs, leafhoppers, psyllids, sawflies, scales, (spider) (red) mites, mealy bugs, thrips and whooly aphids. Attention: Do not use on horse chestnut, Japanese maple or mountain ash. Use as direct above on asters, carnations, chrysanthemums, geraniums, marigolds, petunias, and roses to control (kill) aphids, beetles (including flea beetles and Japanese beetles), caterpillars, plant bugs and whiteflies. Attention: Do not spray blooms or partially open flower buds. Do not use on bleeding heart or gardenias. Test on fuchsias and impatience for varietal sensitivity.